The days are getting shorter and there’s nothing like a cup of herb tea to warm the soul as well as the toes. I recently mixed this year’s batch. Every year it is different, depending on what I have been harvesting and drying all summer. This year’s mix is a bit short on the beebalm because my stand of monarda was much smaller this year. And I tried something different. 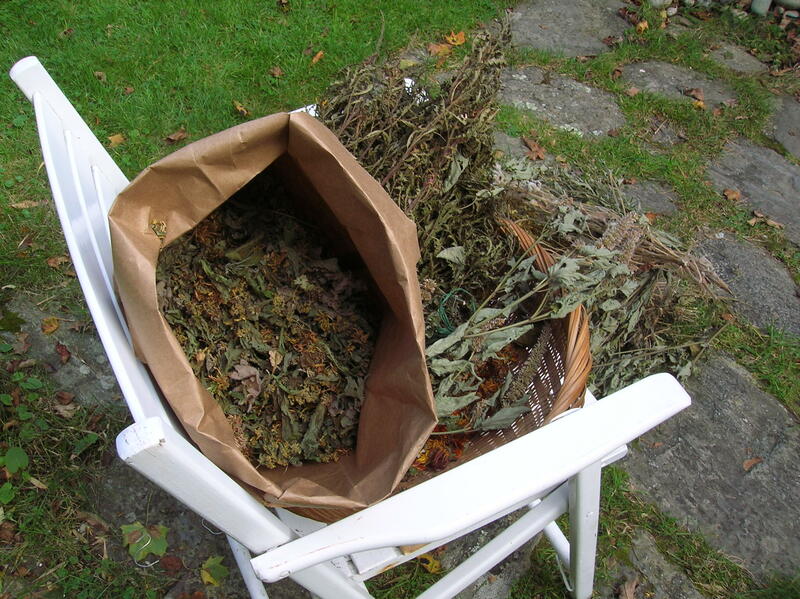 The chore of separating the leaves and blooms from the bunches of dried material always meant a sneezing bout and a rather big mess on the kitchen counter, as well as the floor below. So I moved the process outdoors on a sunny cool afternoon and can report that it went better than expected. The mix can be used as is, or I like to add a tea-ball filled with the mix to a pot of black tea for extra flavor and herb benefits. Of course I would caution anyone preparing their own herb tea mixes to be sure to positively identify the plants they are using to avoid using any toxic plants. Not all herbs are suitable for all people. Again identify your herbs and know what their uses are. 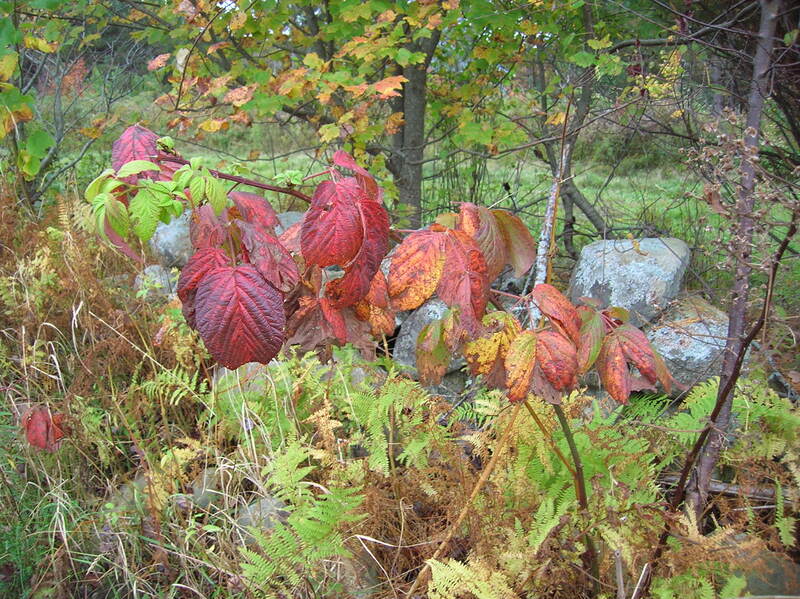 Some years I like to add raspberry leaves that have been touched by frost which turns them a delicious red. Raspberry leaves are a traditional “women’s herb.” Whether you create a mix of a variety of herbs or just one herb, herb teas are an easy way to enjoy the goodness of nature and making your own is an inexpensive way to do that. Anyone who gardens knows what a mood-lifter it can be. Aside from those occasional disasters, crop failures and weed invasions, the act of of planting and watching something grow is one of the most satisfying things to do. 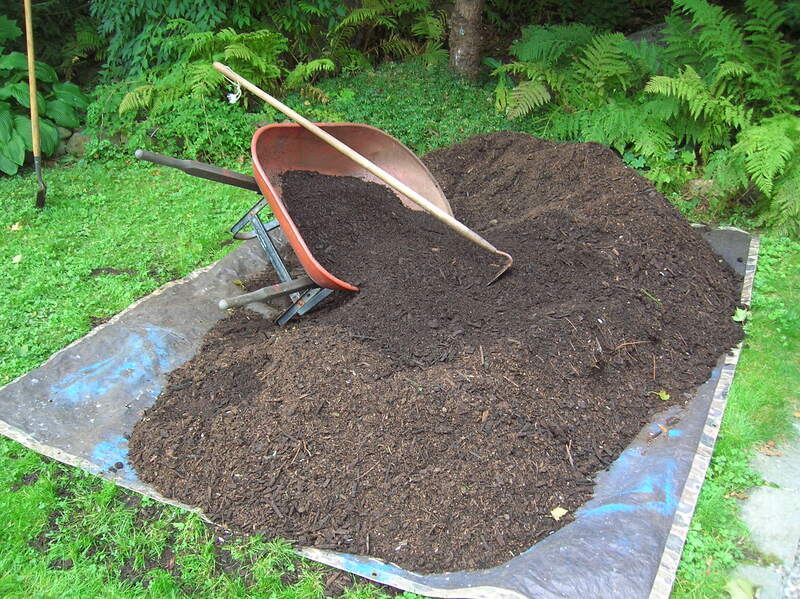 According to the newsletter it is a soil-borne bacteria, Mycobacterium vaccae, that acts as an anti-depressant by causing brain cells to produce high levels of the happy hormone, serotonin. “Serotonin occurs naturally in the body from the gut to the brain, and plays a particularly important role in mood. Low serotonin levels have been linked to anxiety, depression, aggression, OCD, bipolar disorder, fibromyalgia, and irritable bowel syndrome…who knew? Mycobacterium vaccae has already been used medically in cancer patients to increase their quality of life,” the newsletter concludes. So, can you dig it? From Lake County Nursery are two unique dogwoods, the first a variegated-leaf selection, ‘Crème de Mint’ which features variegated foliage on golden chartreuse stems giving it a brighter look than red stems. Compact in size, it tops out at about five feet tall, fitting neatly into smaller landscape sites and is cold hardy to Zone 4a. It is great as a single plant, in groupings or as a hedge. When top grafted on a standard it can also be a unique patio container tree. For an unusual shrub or hedge, try Geauga® Gray Dogwood which naturally forms a hedge screen, and is a selected native providing fruit for birds. This selection of Cornus racemosa ‘Geazam’ grows to a height of six to eight feet tall with a spread of approximately four feet. With an upright shape and creamy-white flowers, this variety provides a white fruit and black-green, glossy foliage. Cold hardy to Zone: 4. Its unique glossy, black-green leaves stand out against mahogany-red new growth, and it thrives in harsh conditions, tolerating wet, dry and poor soils. Touted as a crabapple for all seasons, Guinevere® blooms mid-spring with dark pink buds that open to pale pink, almost white blossoms. Dark green foliage turns shades of orange come fall. This tidy tree stays smaller, and is almost reminiscent of a Japanese maple in the garden. It is suitable for small spaces, according to the “UpShoot” online newsletter. 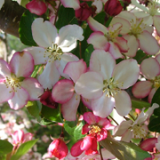 This comely newcomer is part of the Round Table Series of dwarf flowering crabapples from Lake Country Nurseries (lakecountrynurseries.com). Flowers are fragrant, tree is disease resistant and cold hardy to Zone 4. Height is six to eight feet with a 12 to 15-foot spread and rounded shape.